If you’re anything like Us and always have vacation on the brain, then we’ve found a travel essential that will have you ready to call your agent! While there are tons of suitcases on the market, not many meet our requirements: durable, stylish, and with simple mobility. There is nothing worse than struggling to carry our luggage in an airport, so a design that makes it easier to drag through terminals is a must. Once we set our sights on this spinner, we immediately had to whip out our credit card — and start dreaming up our next destination. See It: Grab the AmazonBasics Hardside Spinner Luggage on Amazon for only $50 in multiple colors! Available with Amazon Prime. Not quite your style? Check out other stylish luggage options on Amazon today. Please note that the prices are accurate at the update of publication, January 7, 2019 but are subject to change. What really sold Us on this bag was the hard shell and scratch-resistant finish. This feature works well to keep our valuables secure from point A to point B without being ruined. We also like that the durable finish helps to keep our spinner looking good as new despite rough travel conditions we may experience. Sleek with added strength, this carry-on will easily become our favorite travel companion. We also love that the spinner provides a sturdy zipper for seamless closure. There is also an expandable detail that creates up to 15 percent more space for occasions when we’re traveling with a little extra — or do too much shopping! A compact, yet roomy case that can work well for a business trip or weekend getaway, we look forward to using this trunk with every trip. If that’s not enough, there is also a fully lined interior divider with three additional zippered pockets to keep our valuables organized. Great for storing small items like our toiletries, accessories, chargers and more, this feature is ideal for easy access. We also love the telescoping handles that lock into place. Instead of struggling to extend our handle to its maximum height, this offering does the work for Us. 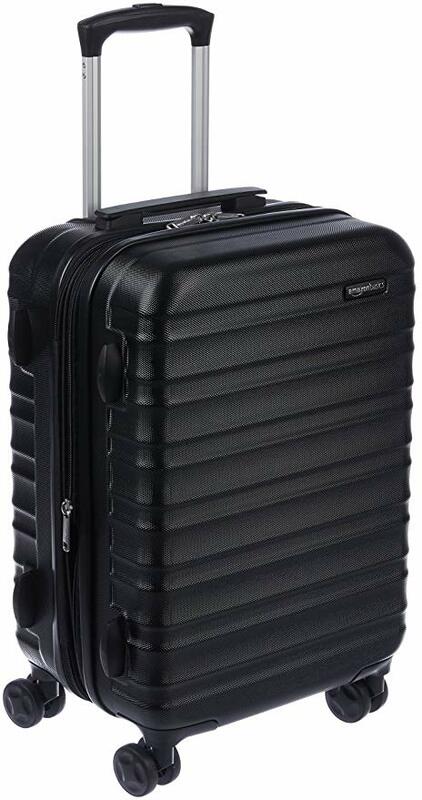 Complete with four double spinner wheels, we can glide our luggage in any direction for smooth-rolling mobility. This surely beats the traditional style that only rolls forward and backward. Available in multiple hues including vibrant shades and classic tones, we can definitely find the perfect suitcase to suit our style. Personally, we love designs that stand out so we can get in and out of baggage claim as quickly as possible, and the orange style is just the ticket. A bright hue that we can easily spot from a great distance away, this creation is just what we need. We can also switch it up with the blue number for the same functional purpose. For those who love classic styles, the navy blue and black options are a great choice. Flaunting a sleek, yet polished appeal, these trunks will set the tone for an elegant look. Best of all? We can scoop up this chic offering for only $50! While most carry-on designs retail for hundreds of dollars, this affordable style gives Us more bang for our buck! Amazon reviewers can’t stop singing its praises! Many reviewers love that this spinner is sturdy and rolls with ease, while others like that you can pack tons of valuables in this bag and it will still feel weightless! Shoppers also appreciate that this construction is well-made and the perfect carry-on size for most airlines. Others liked that there are four different heights that the adjustable handle will lock on to suit our needs. Dubbed as the best affordable luggage on the market, it is only right that we add this product to our shopping cart. Many reviewers also love that you can sit on this product without ruining any of your valuables or breaking the bag, while many like that this case can survive harsh conditions. Shoppers also like that this top-quality creation can rival many of the popular options on the market. We believe that every fashionista should have a durable and stylish suitcase and this design will make a great essential. Spoil yourself for the new year and shop this style while it’s still in stock! Now, we just have to book our next vacation!